Miller Mosley has left the Air Force Academy, marking the second straight year that a runner-up in a freshman quarterback battle has chosen to leave the team. Mosley’s departure was confirmed by coach Troy Calhoun and the academy's chief of media relations, Meade Warthen, who said Christian Miller Mosley "is disenrolled." A native of Alabama, the 6-foot, 190-pound Mosley threw for 34 touchdowns and ran for 28 over his final two years of high school and posted a 38-5 record as a starter. He chose Air Force over offers from Army and Brown and significant interest from Georgia Tech. Mosley and fellow freshman Isaiah Sanders – a local product from Palmer Ridge High School – took the bulk of the snaps in spring practice, particularly in live-tackling situations, as the team eased the load on established veterans Arion Worthman and Nate Romine. Sanders remained in front of Mosley through the late stages of spring practice, but it was hardly a clear-cut victory in the battle for the No. 3 spot. Both showed strong running ability, with the smaller Mosley showing a bit more shiftiness and Sanders a bit more power. Sanders has the advantage in arm strength, but Mosley seemed stronger in the difficult-to-measure such as improvisation. Last year at this time touted recruit Ryan Brand left the academy after Worthman emerged in their battle for the backup job. Brand is now at Maryland, while Worthman took over midseason as a sophomore and helped the Falcons to six consecutive victories to close the season. 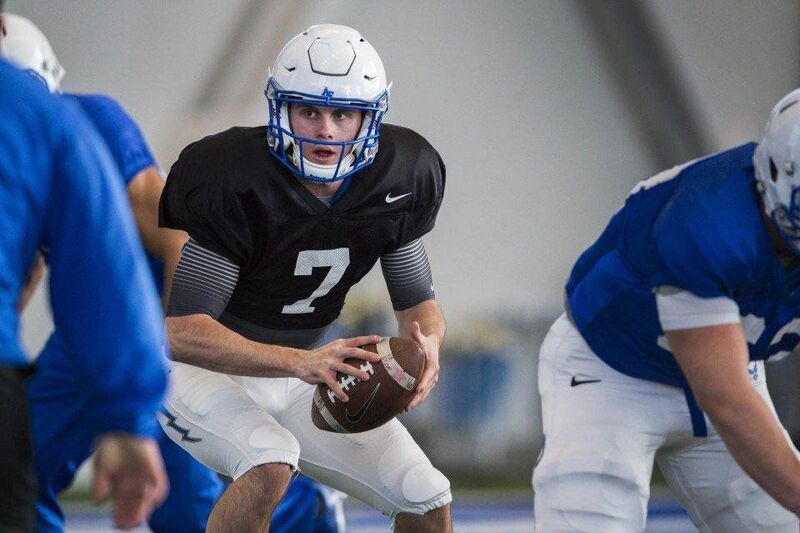 With Worthman seemingly entrenched at quarterback for two more seasons, the incoming sophomore class that includes Sanders would appear to have only one year available to them as the starter. But on the other hand, injuries have plagued the Falcons at that position and three of the past four years have seen quarterbacks other than the one who started the season close as the starter over at least the final five games.